We make it super simple to toggle between your recommended foods. These foods, customized for your body's needs, will improve individual biomarkers or the combination of biomarkers associated with achieving your goals. Your biomarkers are divided into the following color-coded categories: At Risk, Needs Work, and Optimized. This way, you can easily identify which biomarkers, and therefore, which foods should be a priority. Similarly, we identify which goals your biochemistry suggests InsideTracker can help you with the most – because knowing is better than guessing. 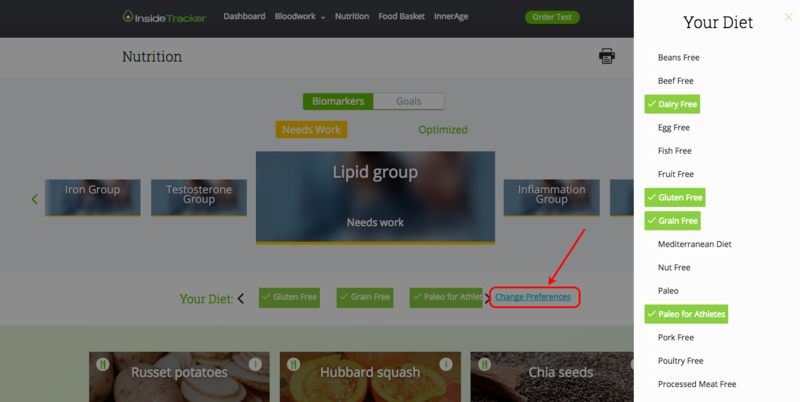 You can easily scroll through either your biomarker list (1) or your suggested goals (2), to select which foods you would like to focus on. We've always taken your dietary preferences into account when recommending foods for you, and now there are even more options. Not into fish? Allergic to nuts? Paleo-only? Vegan? No worries! We show you plenty of other options to your liking that will help you improve and hit your goals. You can select as many food preferences as you like. Your dietary preference settings are based on your responses to the food questionnaire in your profile. You can easily make changes to them by selecting "change preferences" on this page. Foods that are not suitable for your dietary preferences are displayed at the bottom of the page, so that you can see what you're missing out on. The first thing you'll notice are the big, bold photos of recommended food. Beneath each food’s name is the recommended serving size and suggested consumption frequency per week. Something we hear from time-to-time is, “But I already eat all of these foods.” However, including these foods in your diet occasionally or at random intervals in random portions, is not likely to have an impact other than contributing to a healthy diet. We are focused on taking you beyond just a healthy diet. We want you to have an optimal diet—a diet backed by research, which requires you eat a specific amount of these foods a specific number of times per week. If you are in the “I already do this camp” go a step further and consider how many times you eat these foods per week. There are two icon buttons that you will see in the top corners of the food photos. Clicking the info icon on the right will flip the image over and provide more detailed information about the food and its benefits for you. Clicking the utensil icon on the left will provide a recipe using that particular food. 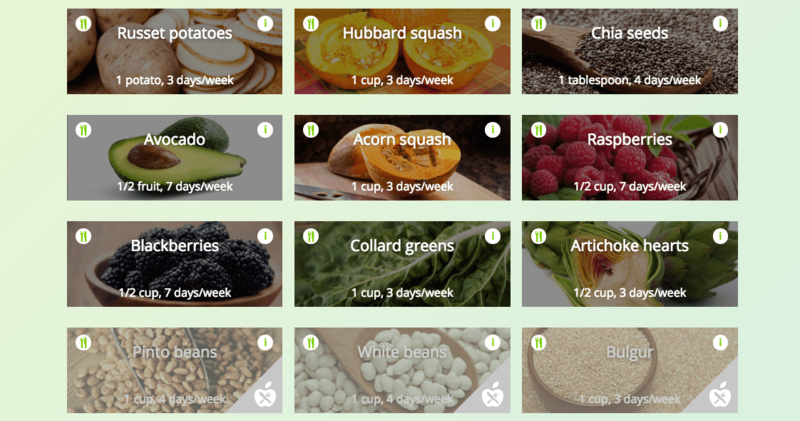 These recipes are InsideTracker developed, tested, and analyzed in order to help you better incorporate these foods into your diet. 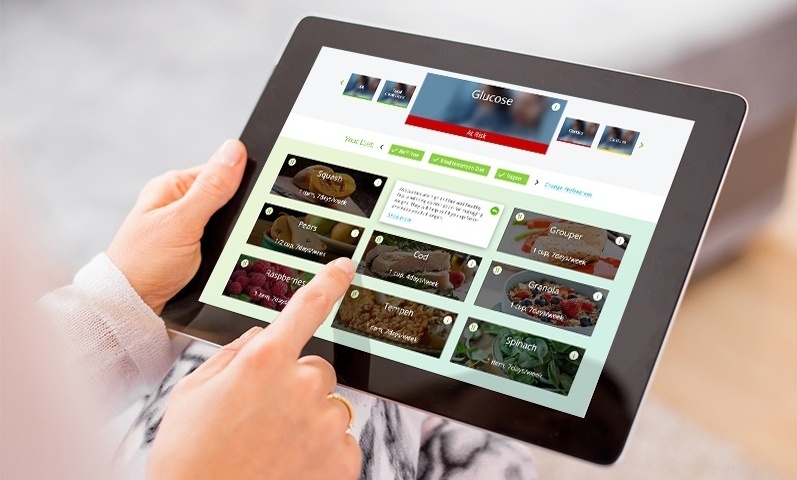 Recipes can be emailed, sent via text message, or saved as a PDF to print, share, or keep for later. We hope you like our recipes! Let us know if you try them by sanpping a pic and tagging @insidetracker on Instagram (or Facebook, or Twitter...)! We are always looking for new ways to improve InsideTracker. Our goal is to provide you with strong, scientifically grounded knowledge to improve your health and performance, as well as innovative tools to help you reach your goals. Gropper, SAS., Smith JL, and Groff JL. Advanced Nutrition and Human Metabolism. Australia: Wadsworth/Cengage Learning, 2013. Print. Bjornholt, J.V., Erikssen, G., Aaser, E., Sandvik, L., Nitter-Hauge, S., Jervell, J. et al. Fasting blood glucose: an underestimated risk factor for cardiovascular death. Results from a 22-year follow-up of healthy nondiabetic men. Diabetes Care. 199;22:45-49. The Expert Committee on the Diagnosis and Classification of Diabetes Mellitus. Report of the Expert Committee on the Diagnosis and Classification of Diabetes Mellitus. Diabetes Care.2002;25(1):s5-s20. Levitan, E.B., Song, Y., Ford, E.S., Liu, S. Is nondiabetic hyperglycemia a risk factor for cardiovascular disease? A meta-analysis of prospective studies. Arch Intern Med.2004;164(19):2147-55. Dinu M, Abbate R, Gensini GF, Casini A, Sofi F. Vegetarian, vegan diets and multiple health outcomes: a systematic review with meta-analysis of observational studies. Crit Rev Food Sci Nutr. 2016 Feb 6:0.